German Empire Passport – Duchy of Saxe-Meiningen 1872, which is a rare type for passport collectors and I am glad to got it into my archive. 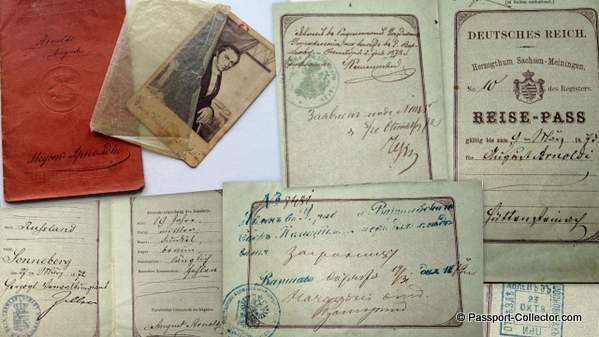 Issued to August Arnodli at age nineteen, in Sonneberg on March 27, 1872 for his travel to Russia. The passport has a Russian visa and border stamp plus another hand written entry. Included is a also a CDV photograph of August’s father Ernst Wilhem. A great example of an early German Empire passport. Saxe-Meiningen was one of the Saxon duchies held by the Ernestine line of the Wettin dynasty, located in the southwest of the present-day German state of Thuringia. Established in 1681, by partition of the Ernestine duchy of Saxe-Gotha among the seven sons of deceased Duke Ernst der Fromme (Ernest the Pious), the Saxe-Meiningen line of the House of Wettin lasted until the end of the German monarchies in 1918. Bernhard, Ernst I third son, received the town of Meiningen as well as several other holdings (Wasungen und Salzungen, Maßfeld und Sand, Herrenbreitungen, Herpf, Stepfershausen, Utendorf, Mehlis and the former Franconian lands of the extinct House of Henneberg, Henneberg). Bernhard chose the town of Meiningen as his residence and became the first Duke of Saxe-Meiningen. From 1682 Duke Bernhard I had the Schloss Elisabethenburg built and in 1690 established a court orchestra (Hofkapelle), in which Johann Ludwig Bach later became the Kapellmeister (1711). In the reshuffle of Ernestine territories that occurred following the extinction of the Saxe-Gotha-Altenburg line upon the death of Duke Friedrich IV in 1825, Duke Bernhard II of Saxe-Meiningen received the lands of the former Duchy of Saxe-Hildburghausen as well as the Saalfeld territory of the former Saxe-Coburg-Saalfeld duchy. As Bernhard II had supported Austria in the 1866 Austro-Prussian War, the prime minister of victorious Prussia, Otto von Bismarck, enforced his resignation in favour of his son Georg II, after which Saxe-Meiningen was admitted to join the North German Confederation. By 1910, the Duchy had grown to 2,468 km² and 278,762 inhabitants.The ducal summer residence was at Altenstein Castle. Since 1868, the duchy comprised the Kreise (districts) of Hildburghausen, Sonneberg and Saalfeld as well as the northern exclaves of Camburg and Kranichfeld. In the German Revolution after World War I, Duke Bernhard III, brother-in-law of Emperor Wilhelm II, was forced to abdicate and his oldest son Ernst on 11/12 November 1918 refused the succession. The succeeding “Free State of Saxe-Meiningen” was merged into the new state of Thuringia on 1 May 1920. As of 2012 the head of the Ducal House of Saxe-Meiningen, Prince Konrad (born 1952), has no children, so the representation of his house will pass to his half brother Friedrich Ernst’s (1935–2004) son Prince Constantin (born 1980).